After completing The Edge of Never by J. A. Redmerski, I was so in love with her writing style I purchased every book available. I had absolute faith in her ability to write paranormal romance and was not disappointed in the least! From the first chapter I was totally in love. Anytime an author can reference Ian Somerholder and The Vampire Diaries (one of my favorite TV series), they have me hooked! The Darkwoods Trilogy is the story of Adria and Isaac. It's easy to say the story had a “Twilight” feel to it because of the age of the characters; however, there is no “love triangle" or vampires, but be prepared because there is tons of family drama! J.A. 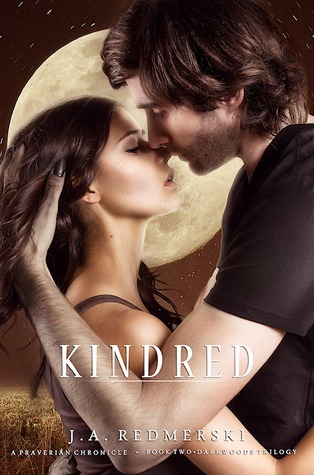 Redmerski pulls you in with her descriptions as she takes you to this new werewolf world but be warned this series is overwhelmingly addictive. Adria and her sister Alex live with their mother and drunk/abusive step father in Georgia. It's definitely not a good situation, but they have each other and try to make the best of things. One night, on their way home, they have a crazy, downright scary encounter and witness something unexplainable, which will forever change the course of their lives. After that night, things go from worse to bad. Adria and Alex are forced to move to Maine and live with their Aunt and Uncle in addition to having to meet new friends and adjust to a new school. Further complicating things Alex is acting weird, closing herself off from Adria and when she does emerge from her room Adria finds Alex keeping company with a very questionable crowd. Adria desperately wants her sister back and will stop at nothing to find out what's troubling her, hoping to "save" Alex even if it's from herself. On her quest for information Adria crosses paths with Isaac. From the moment Isaac's introduced I couldn't help but fall for him, even though I had no idea to his motives and quite honestly wondered if the vibe I was getting and his supposed feelings for Adria were even genunie. He comes across as mysterious, superior, moody and even a player, especially after being caught in what seem to be compromising situations. However, as time prevails he proves himself worthy, fiercely protective of Adria, loyal, swoon-worthy, hot---the perfect Alpha! Not only did I fall for Adria and Isaac but I also found myself connected to many of the secondary characters as well. I loved Harry, their friendship and his ability to keep Adria grounded and talk some sense into her when no one else seems to be able. Alex, Adria’s sister keeps things interesting with her smart mouth and hatefulness. Nathan, Isaac's brother, is hilarious and really made me laugh out loud. And let's not forget Genna, who is so sweet and seems to be the perfect friend/matchmaker you just cannot help but having a soft spot for her in your heart! I've read several YA paranormal romance books, including several based on werewolves. I have to admit this is my favorite series based on werewolves and while it may be considered YA you can most certainly expect a very well developed plot, one which deals not with high school circumstances, but with deep and complicated scenarios and life-altering decisions. There is so much more to this series than a love story between a human girl and a werewolf. It's definitely well worth the $2.99 price tag, don't hesitate to give The Mayfair Moon and The Darkwood Trilogy a chance. What can you expect with Kindred? An increase in the intensity of Adria and Isaac's story and diving even further into an even more complicated plot. As their story continues Adria finds herself struggling to keep her sanity especially as she delves into the events of the night Viktor captured her. The more she remembers the further she falls, ultimately believing she is blood bound with Viktor and fearing she will forever loose both Isaac and her sanity. She keeps this secret and theory to herself, while at the same time Isaac is also keeping a big secret. It's heartbreaking watching them struggle individually and when Isaac's truth finally comes out your initial reaction is to be angry, but then you realize like Adria he was just trying to protect the one he loves. Oh, be prepared it's a BIG reveal! But this big reveal leads right into the mature ya part of the book, and all I'm going to say is that it's good....really good! You can also expect to be introduced to another supernatural being, the Praverian. They have a major connection to Adria and will most certainly be an impact on her future. I really enjoyed their introduction to the story and the possible theories which sprang to mind. As always you can expect vivid and detailed descriptions, further character development, which will only strengthen your connection to many of the characters you already love, more twists and turns in the story line and of course plenty of heart pounding action. One thing is for sure J.A. Redmerski has an awesome imagination and I love diving into her brilliant stories. 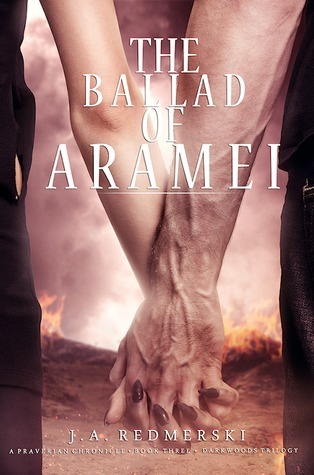 For me the best part of the Ballad of Aramei was finally seeing all the puzzle pieces falling into place and Adria and Isaac finally working everything out and getting their own HEA. I selfishly wised we had gotten a bigger glimpse into their HEA, maybe a deeper look into their future together, but like I said it's a selfish request because I really enjoyed these two characters and wanted watch them enjoy the future they worked so hard to secure. Obviously as with the book's namesake you finally get to hear all of Aramei's heartbreaking emotional story. Another treat was getting to see Adria develop a strength like you haven't seen from her before and taking her rightful place in Isaac's pack. She is forced to make some pretty tough decisions in this final installment and I loved watching her back up those decisions even though her motives may have been misunderstood and essentially caused a war. I could go on and on about this trilogy, it kept me guessing and I could not put it down. My blog partner and I were talking about it for several weeks after we finished. My big “complaint” is that the story left me hanging and wanting more! However, I think the plan is to write more stories for this series, but maybe that has been put on hold with the huge success of The Edge of Never and Killing Sarai. But if you are listening, J.A Redmerski, we want more of the Praverian Chronicles, we love this paranormal series and want to know more about our favorite characters! Honestly, give these books a shot, for only $2.99 you don’t have much to lose. It’s really hard to write a spoiler free review for 3 books, so just trust us, you will LOVE them.